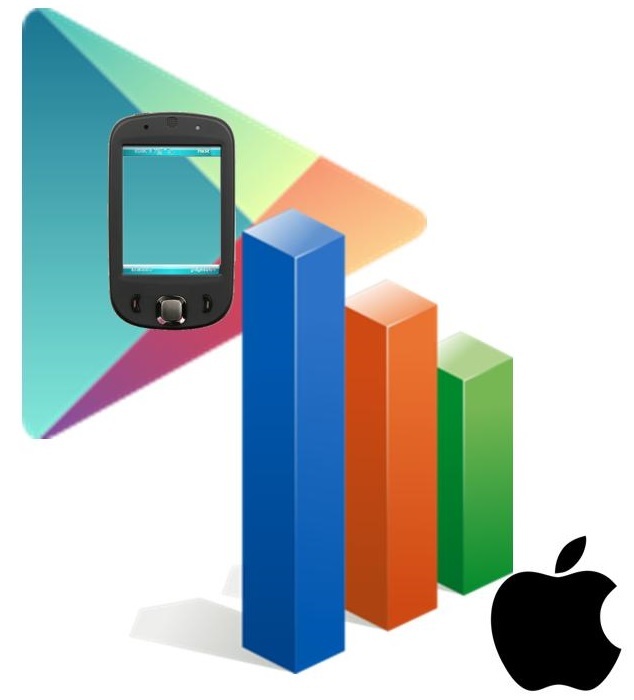 According to a recent report, apps for Android have greater traction than those for iOS. App store analytics firm, Distimo, has just released a monthly global apps report that has provided insight into the mobile commerce growth rates that have been experienced by the industry giants throughout the length of July 2013. This includes an overview of the Apple App Store and Google Play total revenues in the first half of the year. The Distimo report also examined the relative mobile commerce market sizes in each of the countries that it included in its analysis. What it determined was that over the first six months of 2013, both Google Play and the Apple App Store have seen considerable increases in their total revenues. The Apple App store saw a considerably smaller amount of growth at 15 percent than the massive increases that were experienced by Google Play, at 67 percent. At the same time, the mobile commerce earnings from Apple were greater than those at Google. In fact, as much as Google Play may be experiencing faster mobile commerce growth than the Apple App Store, Apple’s revenue generation was twice as large as that of its main competitor. Among all of the mobile commerce markets analyzed in July within this study, it was the United States that was found to have spent the largest amount of money on apps. This was followed by Japan, in second place, and the South Korea, in third place. Those were also the countries that contributed the most to the growth of the revenue at Google Play. Among all of the apps that were sold in the two primary mobile commerce stores in July 2013, the apps that saw the best performance when it came to free downloads, paid downloads, as well as those that experienced the largest amount of global aggregate revenue, were each identified within the study. It also went on to identify the leading publishers for that month within each of those various categories. The report also went on to provide greater detail regarding the leading new apps based on their exceptional performance.